Two years ago, right after getting Lucius, I did a panel baby quilt like this for a friend. 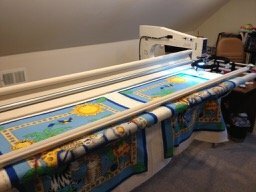 Now another friend has just had twins, and I discovered that my resourceful wife had actually bought FOUR of these panels for her stash! So we pulled out two more of them and did contrasting backing and border flanges for the twins. I was also really sneaky and loaded both baby quilts onto Lucius at the same time! 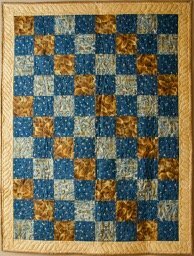 The panto is one that I created for that first quilt, so I lengthened it and just ran it all the way across both quilts. 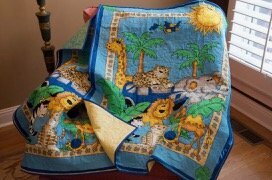 (Well, I had to adjust the laser between the quilts to keep the lions and elephants from being cut by the edges.) More fun. Great quilts Eric! Isn't it fun to sometimes be able to just 'play'... Love the idea of loading the two quilts together. I'm sure that was quite a time saver. How is it that on the last photo of the dual load that it is tucked up? If I don't have a top pinned, it hangs straight down but yours seem to be anchored somehow. Ines, I'm sure Eric will chime in soon. I float all my quilts but use the pvc rings/clamps to stabilize the end that drapes over the bar. If my red snappers are in the way, I also use two long magnets that I got a Harbor Freight (just be careful not to drop them on your feet). Love all these quilts Eric, and also how you loaded the two quilts. I have only done that once, and thought it was a bugger to do. I love using panels for baby quilts. They are just so cute, and it takes a minimal amount of time to get them ready. Love how adventurous you are with freehanding a cable border. It's the best thing to do to get btter, but I'm still not there yet. I have a template to do the cable border, but haven’t tried it yet. I didn’t think I could do it free hand. I like the idea about loading 2 quilts at the same time. Sorry to take so long answering; I've been off on a business trip. When I float a quilt, I use these metal spring clamps to hold the near edge. Got the idea from Angela Huffman when I took her startup lessons. 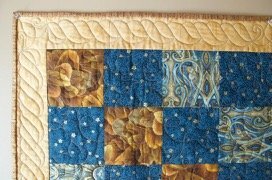 But to be honest, I usually prefer to fasten the quilt to the top roller rather than floating it. That helps me to keep the edges straight and the same width. I only float it when it's a quick little project like these. Off to the hardware store! Thanks Ed and Gator! Love the panel ideas and how you loaded both at the same time! 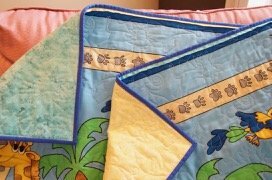 Really cute quilts!